Today is a day that every Yankee fan (and fans of all other 29 teams in baseball) can be optimistic about the possibilities of reaching the postseason. One can hope that the opening day starter, CC Sabathia, can repeat his stats from last season, where he picked 15 wins, had a 3.38 ERA and 197 strikeouts. 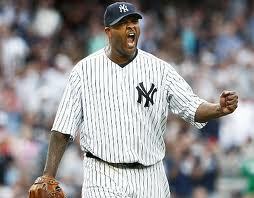 Luckily, Sabathia did not show any signs of losing his stuff or velocity last season. One can also be optimistic that the injured stars on the team – Derek Jeter, Mark Teixeira, Curtis Granderson and Phil Hughes – will not have any setbacks in their recovery or will even return to health in a faster manner. Finally, the Yankees will need to hope that that their very experienced replacements in the Opening Day lineup will be able to perform capably, while not repeating the stats that they put forth last season. In the Opening Day lineup against the rival Red Sox, Eduardo Nunez will be replacing Jeter at shortstop, Vernon Wells will be filing in for Granderson in left field and Kevin Youkilis will be replacing Teixeira at first base (he is also expected to play third base). Alex Rodriguez is also injured as a result of having to get surgery on his hip, but I don’t consider him a star anymore. Youkilis, who was brought to the Yankees after it was determined that A-Rod would return no earlier than July, could be just as good if he can turn back the clock. Youkilis will hopefully be able to duplicate his performance from 2011 when he hit .258 and drove in 80 runs for the Red Sox. This is the Opening Day lineup that the Yankees will send out against the Red Sox in the Bronx at 1:05 p.m.